Today’s interconnected power systems supply a variety of loads depending upon the consumer’s demands. These demands, of course, vary constantly which leads to the variable loading of the system and all its consequences. For obvious reasons of optimum operation, alternators are designed in such a way that maximum efficiency occurs at (or very close to) their rated capacity. Hence, when the load varies and becomes low, the alternator will not be loaded up to its rated capacity and its working efficiency is reduced. This consequently increases the cost of production. In order to keep the frequency within limits, additional control equipments are required. Such equipments increase the cost and complexity of the system. As explained above, variable loading necessitates the use of speed governors, voltage and frequency sensors, microcontrollers and other closed loop control equipments to exert control over the system and maintain all parameters within permissible ranges. Due to variation in loading conditions, various machines like transformers, electronic devices and other machines show increased losses due to magnetization characteristics, saturation and variation in parameters. This decreases the overall efficiency of the system. As stated above, the load on the system varies with time. This variation can be represented graphically and is termed as “Load Curve”. 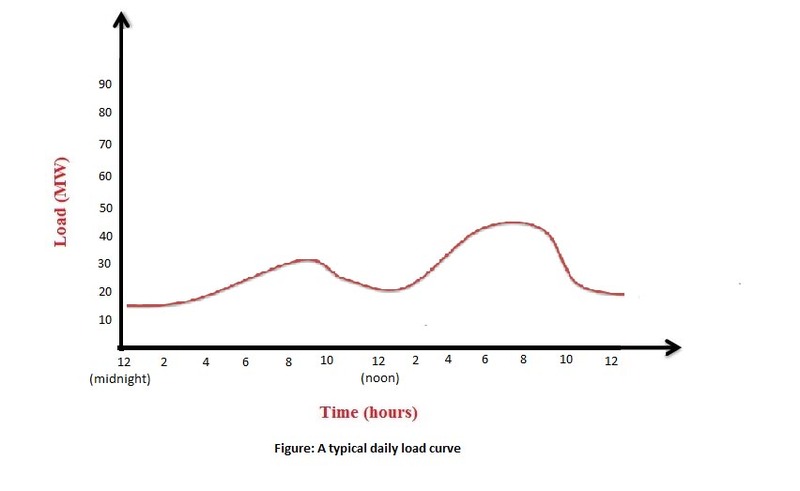 The above figure shows a typical daily load curve. 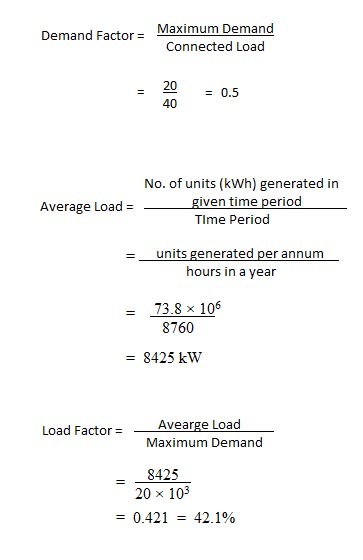 As we can see, the maximum load demand occurs around 8 pm. 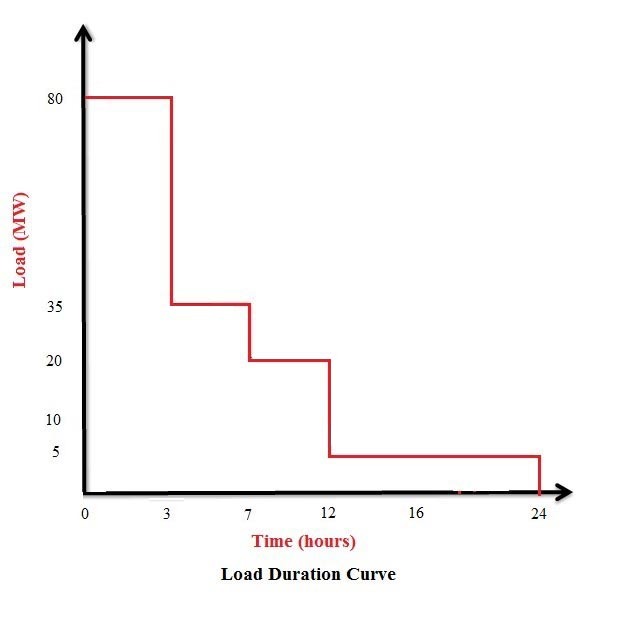 Such a load curve shows the variation of load with time. We can determine the maximum demand on the system too. This maximum demand relates to the maximum load that occurs on the system. This maximum load will affect the size and capacity of the plant. We can also determine the energy (in units or kWh) by calculating the area under the curve. These curves are also needed while selecting the number and size (capacity) of the generating units (alternators). Load curves are also needed in the control and management section for preparing the schedule of the station. When the various loads occurring on a system are arranged in a decreasing order of their magnitudes with respect to the time period of the occurrence of these loads the graph obtained is known as a Load Duration Curve. A load duration curve gives us the data in a more presentable form. We can easily determine the max demand and its duration. Also, we can determine the exact amount of time a specific load has prevailed. This curve is basically generated from the values of the load curve; hence, the area under the curve will also give us the total energy generated. Also, similar to the load curve, the load duration curve can also be plotted for ant period of time. It is defined as “the total sum of all the loads (ON and OFF) connected to the power system. All the loads may not be switched ON together, but such loads have to be calculated to determine the required power and hence the capacity of the units. In the figure no. 1, the maximum demand is 40 MW and it occurs around 8 pm. Maximum demand is measured by a max demand meter. Knowledge of max demand is necessary because the installed capacity of the plant is decided on the basis of max demand since the power station must be capable of supplying the max demand. Since, all the connected loads are not ON all the time, Maximum demand < Connected Load. It is necessary for determination of the required plant equipment capacity. It can be daily/monthly/yearly load factor according to the time period considered. It is less than unity because Average load < Maximum demand. Value of load factor affects the production cost too. It should be as high as possible. If the load factor is high, max demand is low and required station capacity (which depends on max demand) is reduced. This reduces cost of production. Load Factor should be as close to 1 as possible. Also, a higher value of load factor reduces the variable loading problems. This is because, a higher value of load factor implies less variation in demands at various times. Due to this, the effects of variable loading are minimised. Hence Load factor should be as high as possible. A power station supplies a variety of consumers. Each consumer will have an individual maximum demand and such max demands may not occur all at the same time. Obviously, Diversity Factor is greater than 1. This factor gives us the diversification of the load and is necessary to decide the installation, transmission and distribution capacities of the plants. It should be as high as possible. Higher diversity factor means that maximum demands of different consumers occur at different times, and hence, interchange and scheduling is easier and operation is optimum. Another implication of higher diversity factor is that total max demand is lower. This reduces the size (capacity) of the required units and also the production cost. Making use of different time zones. Using two part tariff schemes. Generation = 73.8 × 106 units per annum.